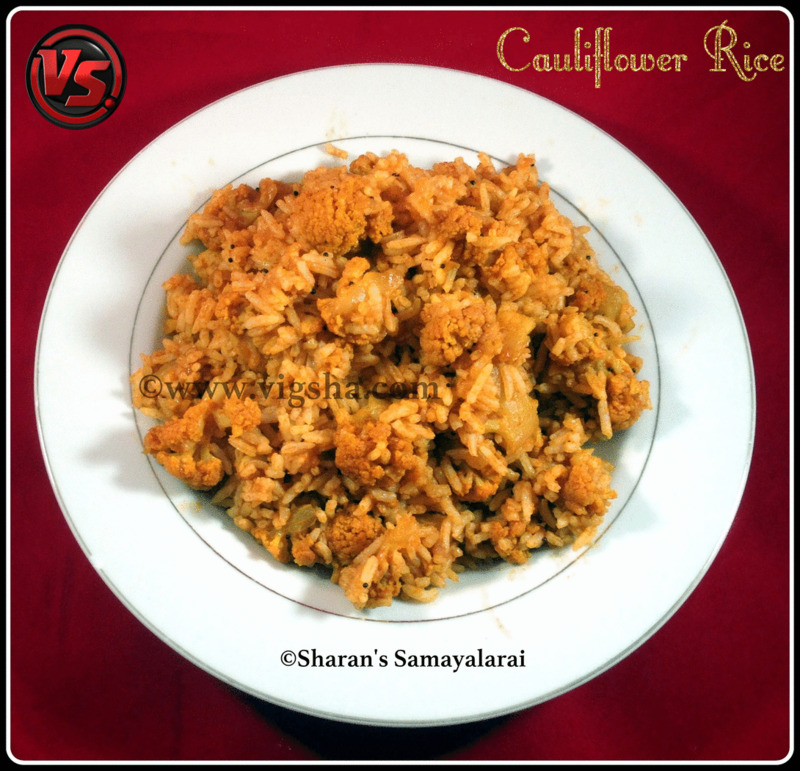 Cauliflower Rice is a simple flavored rice, ideal for lunch-box. Cauliflower is kids favorite veggie and also it is loaded with health benefits. This recipe helps to incorporate this veggie in our daily diet. Cauliflower contains several anti-cancer phyto-chemicals which appears to function as an anti-estrogen agent. Together these compounds have proven benefits against prostate, breast, cervical, colon, ovarian cancers by virtue of their cancer-cell growth inhibition, cytotoxic effects on cancer cells. Cauliflower is a very good source of vitamin C and manganese. It has cancer fighting properties, low fat, low calories and is rich in fiber. 1). Pressure cook the rice and spread it on a plate to cool. Puree the tomatoes in a blender and keep it aside. Blanch the cauliflower florets. Click this link to know how to clean the cauliflower. 2). Heat oil and ghee in a pan, add mustard and let it splutter. Then, add onions and saute till translucent. Add blanched cauliflower and mix well. 3). Add the tomato puree along with chilli powder, turmeric powder and salt. Let the cauliflower cook in the masala and yet retain the crunchiness. Cook covered till the raw smell goes from the masala and oil separates. 4). Turn of the heat and add handful of chopped mint leaves, coriander leaves along with the cooked rice to the cauliflower masala. Stir to combine everything together. Delicious Cauliflower Rice is ready. Serve with chips or raita. # Adding fresh mint leaves along with cilantro is optional, but, it enhances the aroma of the rice. # Adding ghee (clarified butter) along with oil makes this rice more flavorful.